It's almost time for spooks, and buying some candy in the "fun size"--which means fun for me to eat! But seriously, it's now time to buy the candy to hand out, not eat! To go along with that candy, here are a couple of Halloween machine embroidery designs that we have ordered and will have soon. 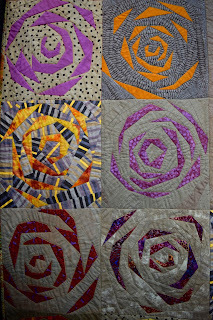 These are from Claudia's Creations, and they had 2 samples made of the same quilted wall hanging, to show the different appearance when done on black vs. white background. Either looks great! I'm picturing this done in less purple and more autumn colors. Now, switching gears back to a new tablerunner pattern for all those stripes and border prints! 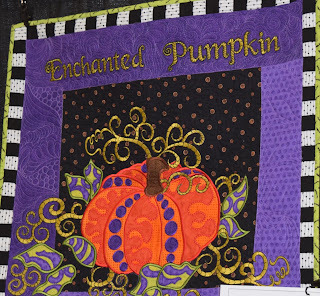 This is Mitered Magic from The Designer's Workshop. Unless you have been living under a rock, or are reading this because it just makes such fabulous reading, you probably have heard of Tula Pink. Her colors and designs have gained quite a following, and now she is beginning her signature line of notions. This looks like they are fighting over those beautiful scissors! She also has a seam ripper and a little snips scissors, all done in that iridescent metal. She told us she has more notions in the development stages. We have ordered these for the store, and can't wait to see them arrive! 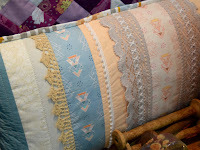 Something else that we have been wanting to bring into the store for quite awhile are the Rennaisance ribbons. So we finally placed an order for an assortment, and we will be showing you some fun ways to use them in your projects. These are gorgeous top-quality designer ribbons. 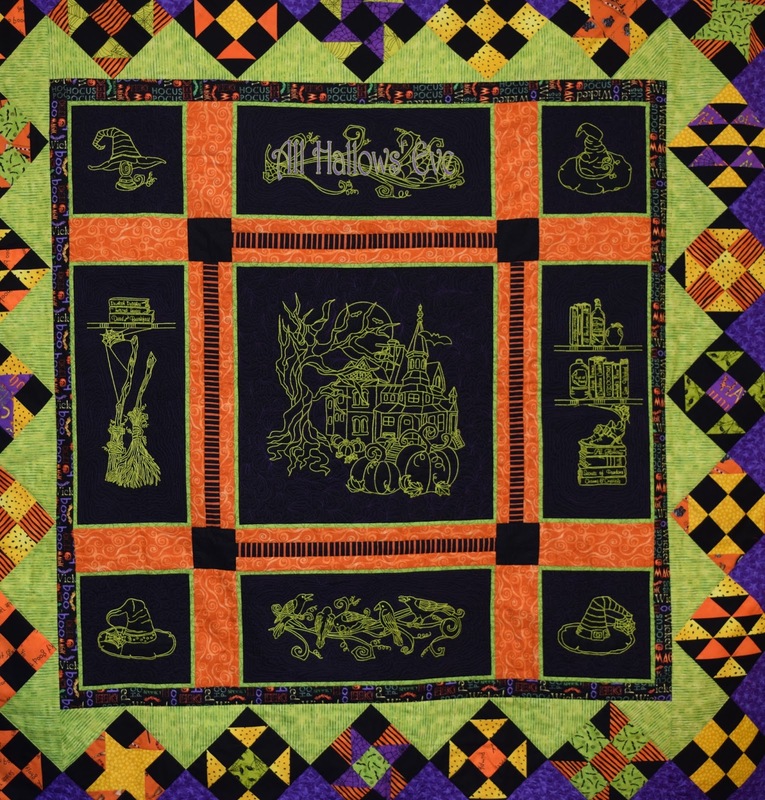 It shows some quilt and block designs, all using English Paper Piecing. We have these instructions and the paper packs for these now, so I hope to see some fun stitching soon! If you are interested in learning more about this technique, Sue has some great instructional videos on YouTube. Here's a few highlights about fabric choices we have made for you! And you don't have to like them all! 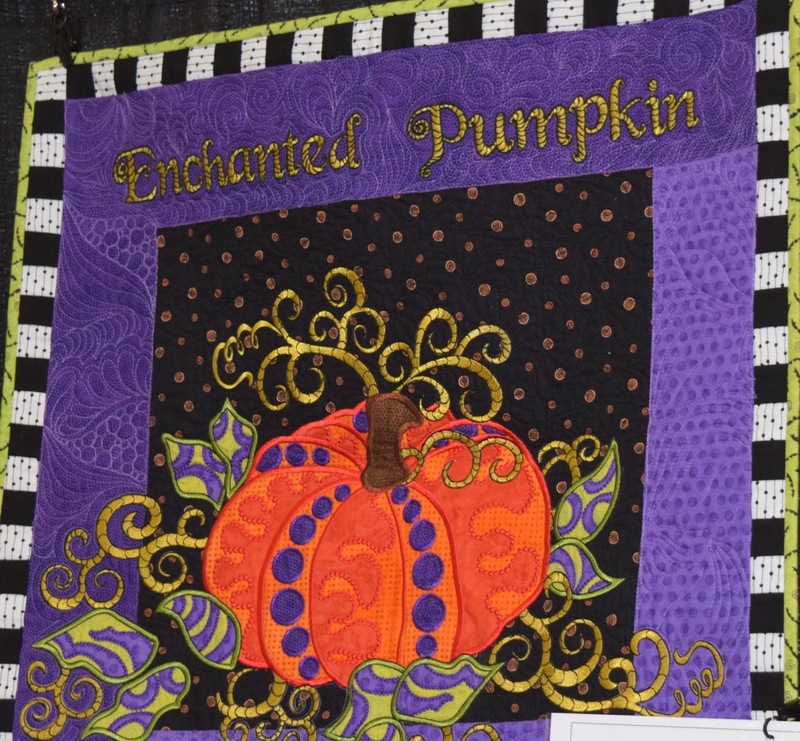 This is an example of a color card, which is just the fabric design printed on paper, not fabric. This is often what the sales representatives show us before the fabric is made. at our monthly Paper Pizzazz group. 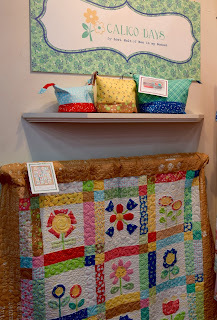 Below is a display for the Calico Days fabric designed by Lori Holt, also made by Riley Blake. 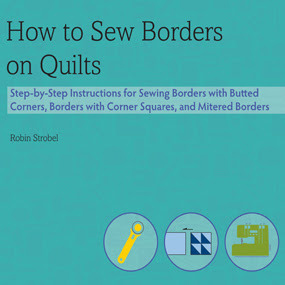 a sew-along that is web-based. 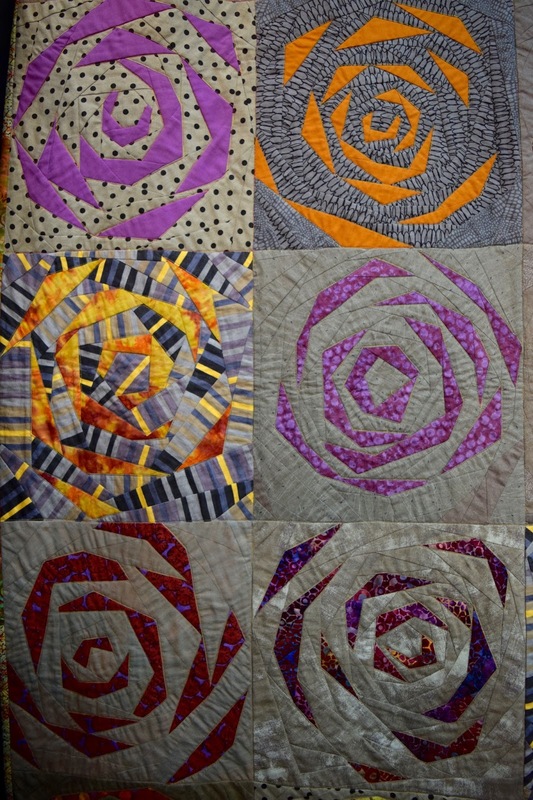 The blocks in the quilt displayed will be made and joined into a quilt. And it's likely there will be other go-along projects, too! Watch our Facebook and email to find out more when the fabric is ready for you in early 2016. 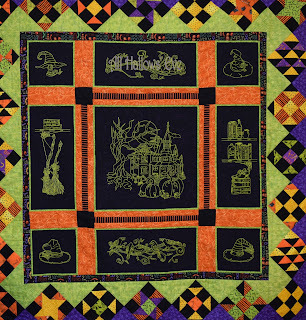 One of the quilting world's favorites for a long time is Pat Sloan. She and Debbie are standing in front of a quilt made of fabric she has designed for Moda. 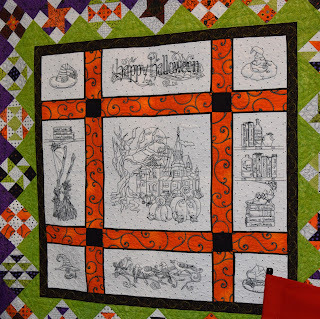 She is always happy and vivacious, and she hosts a radio/podcast for American Patchwork and Quilting. If you haven't listened to it before, you should. She has contacts with so many people and interviews them on her program. 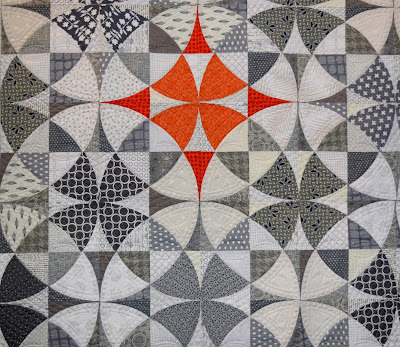 So you get to find out about what's new and current for fabric and quilting. 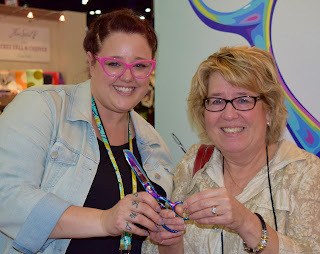 We sat down with our "fabric rep", Julie, to look through new fabric lines coming from Moda. So many to choose from! We had to show some restraint, because we can't have it all! 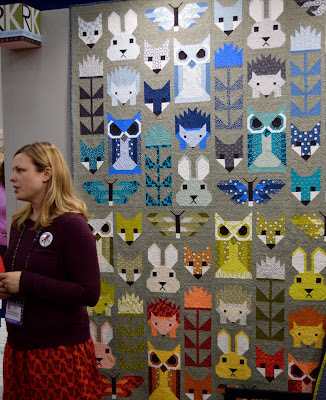 One of the new groups we loved was by Sweetwater designs. but I think it's worth sharing anyway. That's all for today! I have more to share in the next few days! This afternoon Debbie and I will be returning to Minnesota, filled with ideas and plans! Back to work and back to sewing! I don't think I have shared this on the blog previously, so here's a little surprise! About 4 years ago, I was inspired to try filming a little video and create a YouTube channel for myself. So I came up with an idea and one night my videographer (aka Husband Bob) worked out a little video for me. I had been using a tool called the Prairie Pointer to make a bunch of prairie points to be used in a pattern called the Prairie Point Pillow. Say that sentence 10 times fast! Anyway, I added in a demo of inserting the pillow form. Now, you might not think that this task is something that requires a demonstration. After all, we do it all the time, right? But I really like to make the back side overlap deep enough to eliminate any chance of it gaping open and naked pillow showing. This has caused me some trouble with getting that pillowform inserted without straining the seamline stitches to the point of tearing. Then, I had a lightbulb moment! 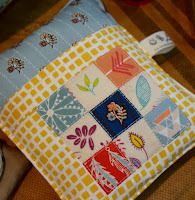 I was visiting with Terry Atkinson, well known local pattern designer, about the pillow patterns she was showing. I got really brave, not wanting to show my ignorance, and asked her just how she managed to get such a nice back side overlap without any rippage. She promptly showed me how to do it, and that's what became my lightbulb moment, and that's what I show on this video. Check it out! We are not letting any little hurricane get in the way of getting the goods for Bear Patch people! There has been nearly non-stop rain for over 24 hours here in Houston from the effects of Hurricane Patricia. So we dusted off the umbrella and tried to avoid the biggest puddles. One of the first places we stopped at was the booth for Tiger Lily Press. 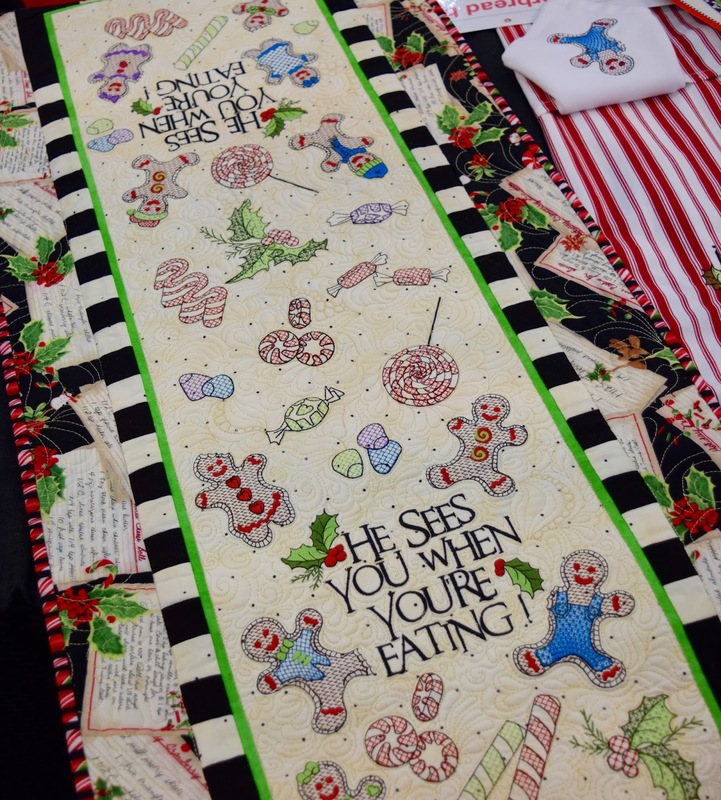 We especially liked some new tablerunner patterns there, and we are picturing these in Christmas fabric to add to our next window display. 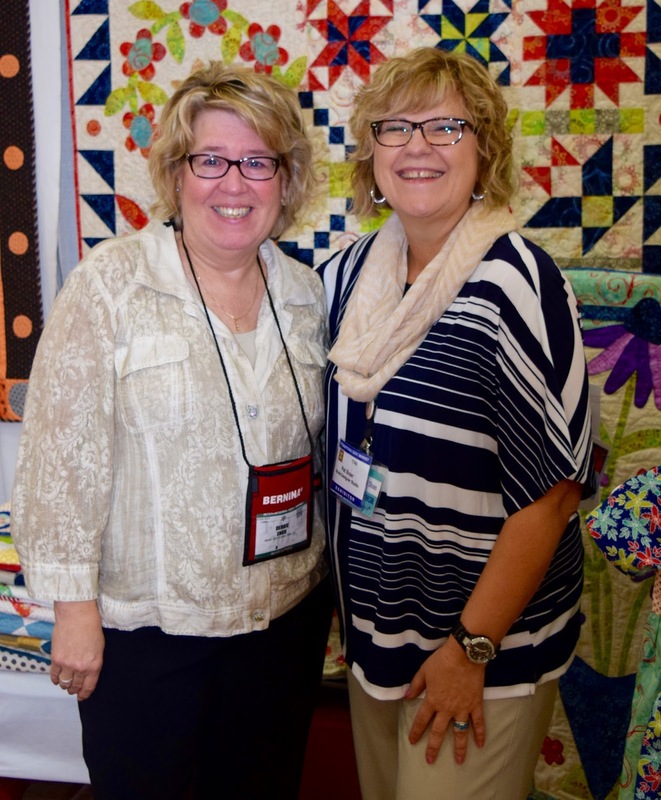 Just down the aisle, we visited the Andover Fabrics booth to get some ideas for the Little House on the Prairie fabric that is coming soon. There are patterns and projects awaiting us! 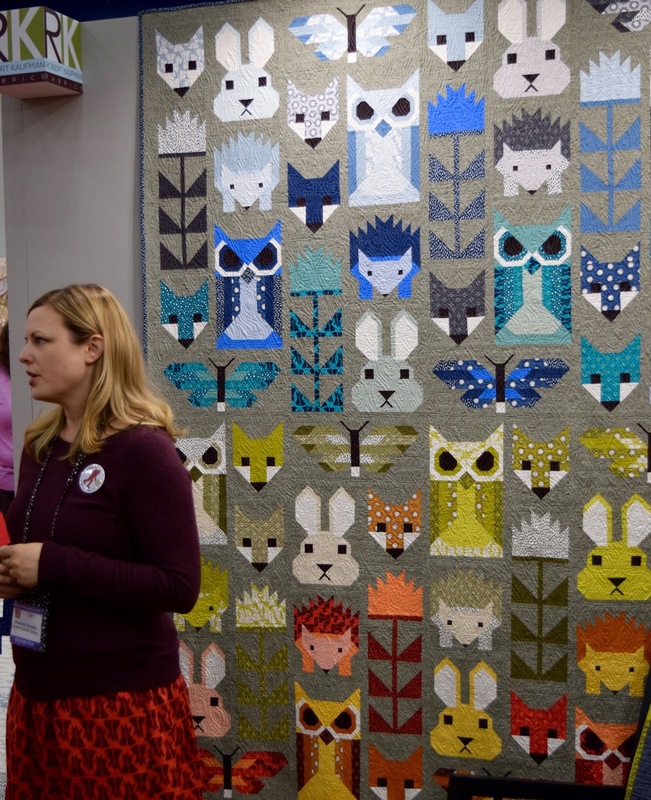 And how do you like this animal quilt by Elizabeth Hartman? Looks like a fun challenge! 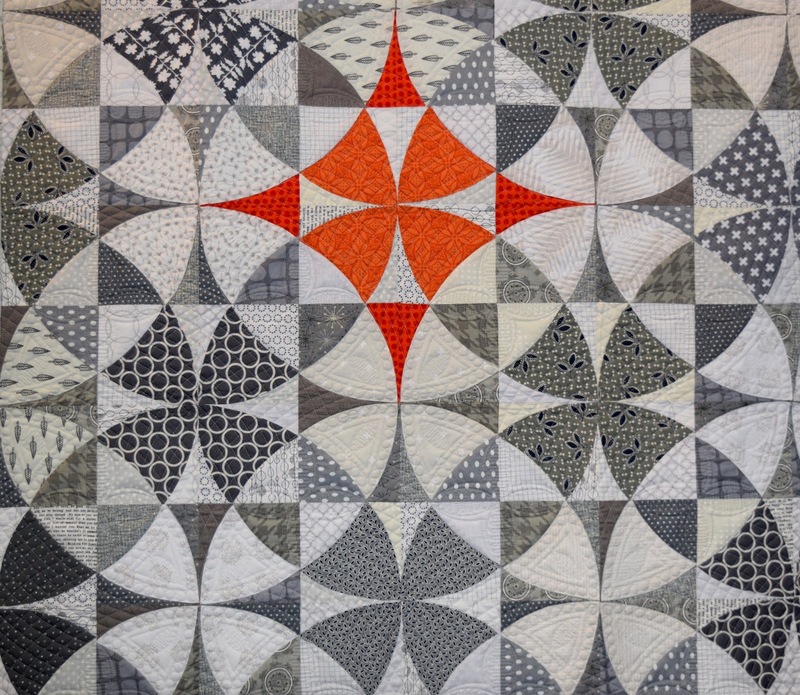 We have ordered the pattern plus fat quarter bundles and solids needed for the quilt. One of our favorite designers of bag and organizers is Annie (Patterns by Annie). This stack of zipped up cases looks like something I would like to do. The large one reminds me of the "train case" that my mom had when we were little kids. I'm not sure why it was called that, but it's the shape that is similar to Annie's pattern. 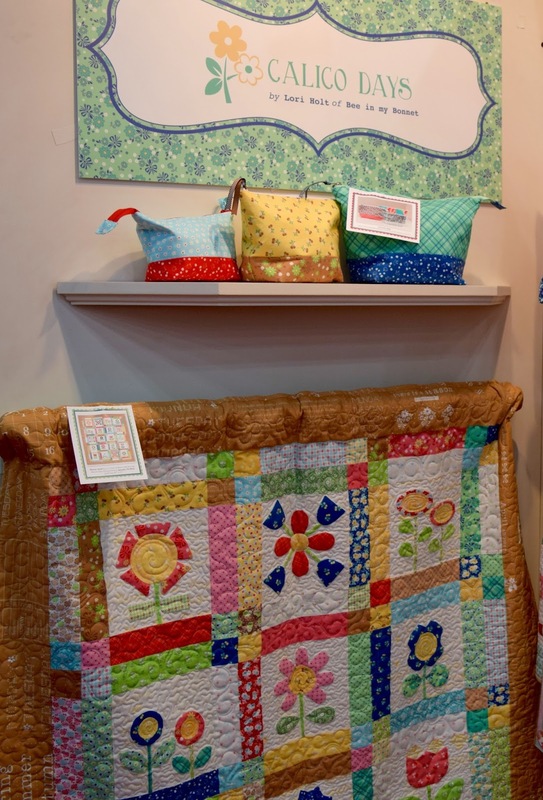 Another great Minnesota designer, Joanne Hillstead, has been busy growing her original Fat Quarter Pop-Up into new sizes and styles, some of them shown below. 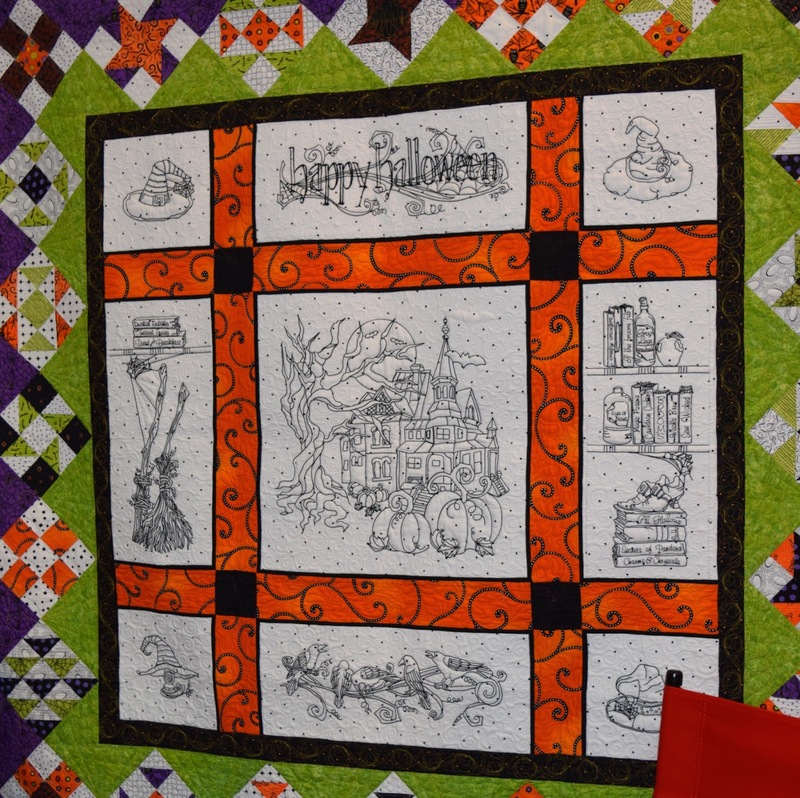 I am teaching a class on making the Pop-Up next Friday, October 30, and Joanne has agreed to pop in for our Pop-Ups! We have more goodies to share so we will get those posted here soon. In the meantime, Debbie has been adding updates to Facebook regularly, so keep an eye on that, too!